Build a Strong Foundation - You CAN Go the Distance! Once you come up with a premise, you have to work out how it all happened. It’s a bit like coming up with a spectacular roof design first. Before you can get it up there, you need to build a solid foundation and supporting structure. You are about to embark on a grand adventure, a marathon (literally) of a journey. You are about to start a training program that will change your body, change your mind, and change your life in many ways. 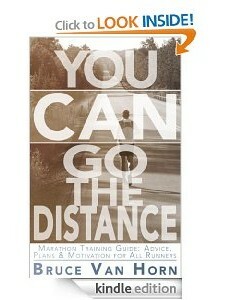 You are about to become a Marathon runner! Before you start your training plan, however, you need to have a solid foundation upon which to build. A solid foundation is an absolute must in order to assure success. The obligatory disclaimer: Common sense is becoming a rare commodity, so I am obliged to tell you to consult a physician or other medical professional before you begin any exercise program, especially a marathon training plan! OK? Seriously, if you have any health issues that might get worse as a result of your training, you really want to know that now before anything bad happens. Go see your doctor and tell him/her what you are planning to do and ask if he/she is aware of anything that would be a problem for you as you train. How many people do you know who have set a New Year resolution to get in better shape? The story is so common it is predictable. You make your resolution and go to a local gym. You are so excited about getting in better shape that you hit it really hard on that first visit—you lift weights, you run on the treadmill, you take an aerobics class—and you feel really good while you are doing it! Right? Right! That is until the next morning when you can’t get out of bed or bend over to pull up your pants because you are too sore! Often, when we get excited about a new exercise program or goal, we go into it thinking we can accomplish anything and we over-do it. Consequently, we are too sore to go back to do it the next day… or the next. Or worse, we hurt ourselves on that first day and we physically can’t go back to do it again anytime soon. I don’t want this to happen to you! It is extremely important that you build a strong foundation before you start your marathon training. I want you to look at the first week of your marathon training program to see what is going to be required of you. Many plans have you running at least 8 miles for the Long Run in the first week. That is exactly what my plan, the YCGTD Marathon Training Plan, requires in Week 1. If you have never run 8 miles before, I don’t want you to even attempt starting Week 1 yet. The last thing I want you to do is start your training program and get frustrated, or injured, and quit! Also, I want to remind you that you CAN go the distance! So, if you are looking at Week 1 and thinking that you can’t go 8 miles, I want you to stop right now and change your thinking. I want you to change the phrase “I can’t” to “I can’t, yet” and just get started with any distance. Every world-class runner started right where you are now. Deciding to try it and then getting out there and doing it, one step at a time, is how they became world-class. You CAN do this! I want you to start out short and easy for a few weeks. Short and easy will build the foundational muscles you need, and, more importantly, it will build the foundational confidence you need. Give yourself some small victories at the very beginning. Those small victories will propel you into bigger victories as you grow. Take however many weeks you need to build up to the point you can go the distance required by Week 1 of your chosen plan. I also don’t want you to be concerned with time… yet. Even if you just walk the 8 miles, that’s OK. You are training your brain to go the distance—and that is the most important muscle you need to train! Once you have trained your brain to go the distance, your brain will train your body. I want you to get to the point that you can do whatever is required by Week 1 of your program for at least two weeks in a row before you officially start your training. If it takes you five weeks to get to the point where you can do your Week 1 requirement, that’s fine. In fact, it’s more than fine—it’s fantastic! It is fantastic because you have stuck it out for five weeks, which means you are committed and already showing signs of mental endurance, and that will serve you well as you train for your marathon. So, promise me, and promise yourself, that you will start off very easy to avoid injury or frustration and that you will not just jump into Week 1 without having built a strong foundation. A house built on a strong foundation can weather many storms! Rory, personally, I don’t like the idea of running 7 days a week. I think your body needs the time to recover, which is when you’ll build strength and endurance. I would continue to run 4 miles 3x a week and then do a 6 mile long run. Keep your 4 milers, but keep increasing the distance of your long runs until you get to 8.